LED (light emittance diode) with GaN semiconductor has been used for various products along with a recent green energy direction (energy saving, efficient emission and long-life lamp) and smart-grid urban development (energy demand management with latest digitized infrastructure). 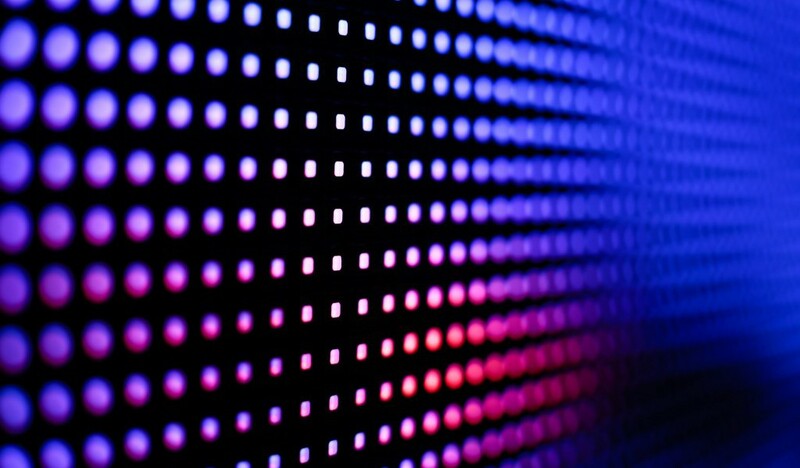 For instance, LED is used in general lighting lamps, traffic lights, automobile headlights and backlights of the small monitors on the smartphone and the tablet and the large monitors for advertising. Improvement of optical output and stable process technology to reduce manufacturing cost are essential for growth of LED market. Most of the GaN blue LED element manufacturers use element manufacturing process with patterned sapphire substrate (PSS) to produce high-output and efficient LEDs at a high rate yield. 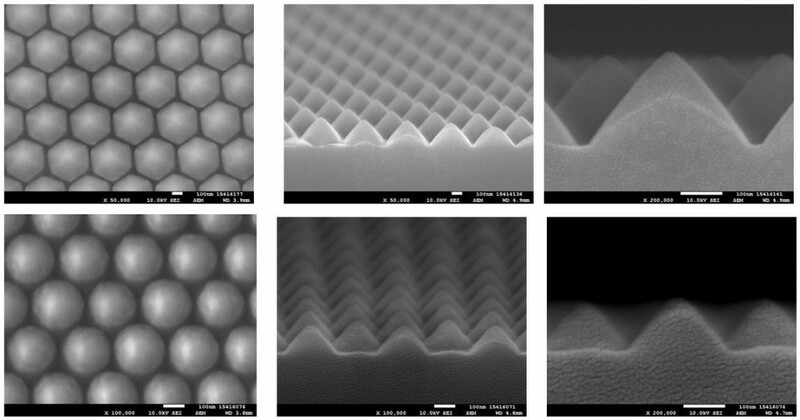 The pattern applied to a sapphire substrate reduces defect density of GaN crystal grown on the substrate, which improves the emitting performance of GaN emission layer. Furthermore, by designing optimum pattern shape, the light emitted from emission layer to the inside of the element is efficiently reflected onto the outside of the element, which can reduce internal loss of the light (the loss becomes the heat generation). Conical shape is used commonly. At present, photoresist mask is formed on the flat sapphire substrate and ICP dry etching is used for PSS processing, and pattern size, shape design and accuracy of the mask, pattern aspect ratio (ratio between height and width), substrate surface uniformity and repeatability between the substrates are important for forming the shape. Although, the literature and data from manufactures verify that the smaller pattern size produces higher pattern region ratio to substrate surface, which leads to efficient emission, the present standard pattern size used is 2 to 3um. Dry etching requires PR selectivity, bias RF, ICP plasma uniformity, pressure control, substrate stage temperature control and reactive gas control as technology components. It is important to reduce defect of grown GaN crystal for improvement of emitting performance of GaN emission layer for the following reasons. Sapphire substrate has heat resistance, mechanical strength and chemical stability, which is suitable for the crystal growth process (mainly MOCVD process) of group-Ⅲ-Ⅴ nitride semiconductor. However, lattice mismatch between GaN nitride crystal and sapphire substrate is large and distortion occurs longitudinally when the crystal is growing, which generates line defect (micro piping) resulting in low emission efficiency of emitting layer. By preprocessing PSS pattern, transverse GaN crystal growth is promoted and line defect is decreased relatively. Generally, emission conversion efficiency is increased by approx. 30%. Although, wide pattern width and high height to the width are mainly used in pattern design to reflect emission to the inside of the element onto the outside of the element, short pattern cycle interval can increase pattern density, and nano-scale patterning (nano-PSS) is under study. However, nano-PSS requires photoresist process by high-resolution lithography, and high initial investment and strict substrate flatness are difficult issues. In the meantime, some manufacturers make a study of pattern mask forming by nanoimprinting without high-resolution lithography. ULVAC’s ICP plasma etching system provides two latest achievements for PSS process as described below. System Configuration 1C＋1LL(Transfer ch. )＋1E ch. 1C＋1LL（Transfer ch.）＋1E ch. We have accepted many requests for PSS sampling using INE-3085 from LED manufactures and sapphire substrate manufacturers.